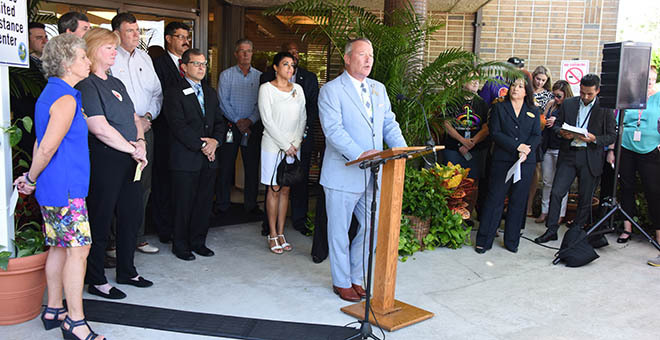 Original photograph of Orlando Mayor John Hugh "Buddy" Dyer speaking at a vigil that was held for the victims of the Pulse Nightclub shooting. The event was held at the Dr. Phillips Center for the Performing Arts at 445 South Magnolia Avenue in Orlando, Florida, on June 13, 2016. Pulse was located at 1912 South Orange Avenue in Orlando, Florida. In the early hours of June 12, 2016, an American born security guard named Omar Mir Seddique Mateen shot and killed 49 people and wounded an additional 53 at Pulse, a gay nightclub in Orlando, Florida. Mateen, who swore allegiance to the Islamic State of Iraq and the Levant (ISIL), was shot and killed by the Orlando Police Department after a three-hour standoff. The incident was the deadliest mass shooting by a single gunman in United States history, the deadliest terrorist attack in the United States since the September 11th attacks of 2001, and the deadliest incident of violence against LGBT people in United States history. Most of the victims were Latino, as the club was hosting a Latin Night at the time of the massacre. Original color photograph: RICHES of Central Florida, University of Central Florida, Orlando, Florida. Pulse Collection, RICHES of Central Florida. Originally created by Sarah Schneider and published by RICHES of Central Florida. Copyright to this resource is held by RICHES of Central Florida RICHES of Central Florida for educational purposes only. Neale, Rick. ""Orlando vigil attracts thousands to Dr. Phillips Center." Florida Today, June 13, 2016. Accessed April 13, 2017. Sallah, Michael. "What happened between 2 and 5 a.m.? The Orlando massacre, minute by minute." Miami Herald, June 15, 2016. Accessed November 7, 2016. http://www.miamiherald.com/news/state/florida/article84076637.html. Alvarez, Lizaette and Richard Perez-Pena. "Orlando Gunman Attacks Gay Nightclub, Leaving 50 Dead." New York Times, June 12, 2016. Accessed November 7, 2016. http://www.nytimes.com/2016/06/13/us/orlando-nightclub-shooting.html?_r=0. Ogles, Jacob. "Pride in Orlando Will Take on New Meaning." The Advocate, October 6, 2016. Accessed October 18, 2016. http://www.advocate.com/pride/2016/10/06/pride-orlando-will-take-new-meaning. Sayer, Harry. "UPDATED: Every Orlando area vigil and memorial happening this week." Orlando Weekly, June 17, 2016. Accessed November 7, 2016. http://www.orlandoweekly.com/Blogs/archives/2016/06/13/heres-every-orlando-area-vigil-and-memorial-happening-for-the-pulse-victims#. Bevil, Dewayne and Desiree Stennett. "Crowd estimated at 50,000 packs into Lake Eola Park for Pulse vigil." Orlando Sentinel, June 19, 2016. Accessed November 7, 2016. http://www.orlandosentinel.com/news/pulse-orlando-nightclub-shooting/os-pulse-vigil-lake-eola-20160619-story.html. Weiner, Jeff. "Orlando to buy Pulse nightclub, turn it into memorial." Orlando Sentinel, November 8, 2016. Accessed November 9, 2016. http://www.orlandosentinel.com/news/pulse-orlando-nightclub-shooting/os-pulse-nightclub-orlando-update-20161107-story.html. Schneider, Sarah. 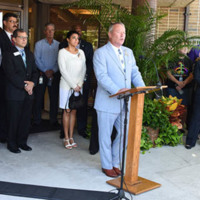 “John "Buddy" Dyer at Pulse Vigil at Dr. Phillips Center for the Performing Arts.” RICHES of Central Florida accessed April 24, 2019, https://richesmi.cah.ucf.edu/omeka/items/show/9806.